Previously, Libyan National Army spokesman Ahmed Mismari said that forces under the command of Marshal Khalifa Haftar were carrying out an offensive on the country's capital, Tripoli, in several directions, but had not yet entered the city. CAIRO (Sputnik) — Marshal Khalifa Haftar's Libyan National Army (LNA) on Friday captured the international airport in Tripoli, a source close to Haftar's entourage told Sputnik. “The Tripoli International Airport has been taken under control, fighting is taking place in its vicinity,” the source said. It comes shortly as Haftar told UN Secretary-General Antonio Guterres that his forces would continue fighting against the armed groups that control Tripoli, noting that the city's residents were "fed up" with them. UN Secretary-General Antonio Guterres, in turn, said he was departing from Libya with a "heavy heart" but with hoping that recent tensions would not lead to a confrontation. "I leave Libya with a heavy heart and deeply concerned," Guterres said in a Twitter post. "I still hope it is possible to avoid a bloody confrontation in and around Tripoli." Earlier in the day, a source in the LNA told Sputnik that the forces of the Libyan National Army, led by Khalifa Haftar, have assumed control over several southwest neighbourhoods of Tripoli, engaging in no major clashes so far. "As of now, the streets of the city are empty. It seems that almost all residents have chosen to leave the city. Several areas are already occupied by the LNA forces, for example, Janzur and Al-Swani, which are in the south-west of Tripoli. No clashes have taken place yet, only a few minor attacks from gangs along the way [of the Haftar army divisions] to Tripoli", the source said. Meanwhile, the mayor of Garyan in Libya told Sputnik on Friday that the LNA, led by Haftar, had assumed control of the city without fighting. "The Libyan National Army entered Garyan and assumed full control over it without any resistance on the part of the armed militia that had withdrawn in the direction of Tripoli several hours before the LNA coming," Bahlul Sayyid said. The mayor said that the situation in the city was calm, no sounds of clashes were heard in neighbouring settlements. Haftar's army was advancing upon Tripoli, he added. According to Sputnik source, head of the Government of National Accord (GNA), Fayez Sarraj, remains in Tripoli despite the LNA offensive. Commenting on the operation, LNA spokesman Ahmed Mismari stated that the army is continuing to advance. "We are next to Al-Swani. This is a heavily populated settlement about 25 kilometres [15 miles] south of Tripoli. We are also advancing toward Tripoli from other directions. In addition, we are conducting an operation in Janzur, but unfortunately, we have had to withdraw a little from there", Mismari told Sputnik, adding that the LNA had not reached the capital yet. He also said that he could not predict when the operation would conclude due to the conditions under which it was being conducted. Meanwhile, the tracker Flightradar24 shows that Mitiga International Airport and Tripoli International Airport are operating as usual. Addressing the situation in Libya, Arab League Secretary General Ahmed Aboul Gheit called on both sides of the conflict to show restraint and to take urgent de-escalation measures. 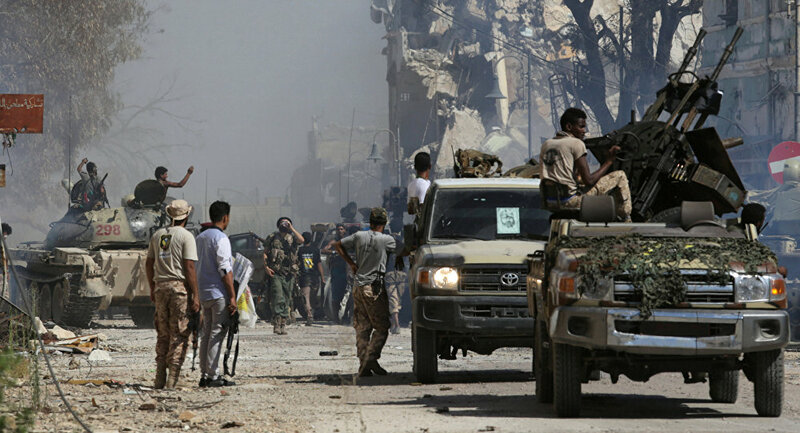 The news comes after media reported on Thursday that the LNA commander had ordered an offensive on Tripoli, controlled by the UN-supported interim Government of National Accord after his army took control over cities of Surman and Garyan. On 20 March, the United Nations announced that it would sponsor a conference in Ghadames on 14-16 April to address the crisis in Libya and set a date for the long-awaited elections that could restore peace and security for the nation. As a result of a years-long civil conflict that erupted following a rebellion and murder of the ex-head of state Muammar Gaddafi, there is no single central government in Libya, and the country's eastern and western parts are controlled by separate powers. The Tobruk-based parliament, elected in 2014 and backed by the LNA, governs the east of Libya, while the GNA, established in 2015, controls Libya's western parts from Tripoli. R ~ What a piece of work this muppet is. Clearly he utterly lies by omission - to whit - the UN was never invited into Libya. He talks as if he and his UN entourage was welcomed or wanted. So go take your evil heavy heart back to the synagogue they call the UN. You are just another tool in an organization that exist only in your made up world of bills, acts, statutes, terms and other man-made legal constructs that are all diametrically opposed to God's law, a world they think they can run better than the creator. He created it, he owns it. The UN owns nothing, not even the building they stuck the name on. One other thing - will we be hearing from Trump that the US has left Tripoli because the mission has accomplished the destruction of Libya's infrastructure, killed Qaddafi as if that a good thing and stole Libya's gold because Libyan's are sure to use the gold for their needs rather than Goldman Sachs who's only apparent function in the economic world is to defraud and steal.